For undergraduate/graduate courses in Community Nursing and Family Nursing. 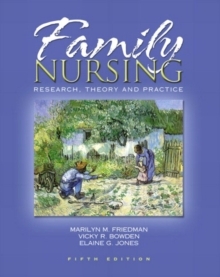 This popular text addresses the full practice of family nursing-identifying the family as a whole-and teaches a holistic, philosophical approach. The student is guided through generalized concepts and theoretical foundations, reality-based applications, case studies, thorough and updated discussions, assessment, and nursing diagnoses. Well-organized and complete, this edition includes foundations in family theory and family nursing-essential in preparing a comprehensive family nursing assessment and planning appropriate interventions.